The Joy of Birthing - Welcome! If you are pregnant, or know someone who is, you're in the right place! I offer pregnancy, birth, placenta and some breastfeeding services, as well as education on Rebozo Techniques for Couples and Birth Professionals, pre/post natal massage, infant massage & instruction to parents, Spinning Babies techniques (trained by Gail Tully herself! ), Comfort Measures for Birth classes, along with natural parenting techniques, information on vaccines, circumcision, and more! A doula is (generally) a woman, trained in childbirth, who provides emotional, physical and informational support to the mother person who is expecting, is experiencing labor, or has recently given birth. 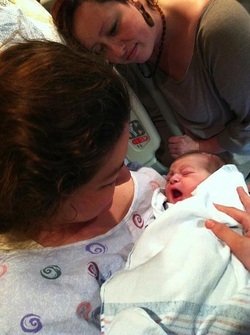 The doula's purpose is to help the birthing person have a safe, memorable and empowering birth experience. Most doula-client relationships begin a few months before the baby is due. During this period, they develop a relationship where the individual (and their partner) may freely ask questions, express fears and concerns, and take an active role in creating a birth plan. Most doulas make themselves available to the expectant parent by phone, in order to respond to their questions or explain any developments that might arise during the course of the pregnancy. Doulas do not provide any type of medical care. However, they are knowledgeable in many medical aspects of labor and delivery. Consequently, they can help their clients gain a better understanding of the procedures and possible complications of late pregnancy or delivery. During delivery, doulas are in constant and close proximity to the birthing person. They have the ability to provide comfort with pain relief techniques, including breathing and relaxation techniques, massage and laboring positions, positive affirmations and an overall "motherly" care. Doulas also encourage participation from the partner as well. A doula acts as an advocate for the expecting parent(s), as well as the baby, encouraging and helping them fulfill specific desires for their birth. The goal of a doula is to help the expecting parent(s) experience a positive and safe birth, whether un-medicated, medicated or cesarean. After the birth, many labor doulas will assist parents with the breastfeeding/chestfeeding process and encourage bonding between the new baby and other family members. What is the cost? What does it cover? Depending on experience, doulas charge and average of anywhere from $300 to $1,800. That generally includes prenatal home visits, and being on-call from the second labor starts until about an hour after delivery. They assist with that first latches, then come to the home for a follow-up visit within 10 days. The fee for my Doula Service is $650-1000. I ask for 50% at the time of contract signing, which will reserve your due date and on-call period. The remaining portion is due by 36 weeks. I am able to offer payments plans and gift certificates as well. Please see my FORMS page for the contract and more information on packages inclusions. While we, as a community are working hard to have insurance companies recognize our beneficial importance during labor and delivery, there are very few who will directly reimburse or pay outright. That being said, you may & should submit a claim for reimbursement or use of funds from your HSA/flex-spending accounts. It is not completely unheard of for clients to be reimbursed.